Here is the list of the hotels near Plaizac. Book your hotel near Plaizac today, Thursday 16 May for the best price, reservation and cancellation free of charge thanks to our partner Booking.com, leader in on-line hotels reservation. Below here is the list the 50 closest hotels of Plaizac, sortable according your criteria. You will find the position of these accommodations on the Plaizac hotels map. Le Clos Notre Dame is a B&B located 5km from Rouillac and 20 km from Cognac. It features a closed garden, an outdoor swimming pool, a fitness room and a spa. Free WiFi access is available in the public areas. At Le Clos Notre Dame B&B, guests can find rooms viewing the garden with a seating area and a private bathroom with a bathtub and a hairdryer. Breakfast is served daily and guests can relax in the house's shared lounge. Upon request, they can also share a meal featuring regional specialties at the owner’s table or have packed lunches prepared. Bicycling and hiking can be enjoyed nearby. A10 motorway is located 60 km away. The property offers free parking. Le Dojo du Plessis is set in Mareuil and offers free bikes and a garden. It features garden views and free WiFi. Breakfast is available each morning, and includes continental and gluten-free options. The bed and breakfast offers a terrace. Cycling can be enjoyed nearby. Angoulême is 32 km from Le Dojo du Plessis. Maison de Claire et Bruno is offering accommodation in Rouillac. Both free WiFi and private parking are available at the guest house. At Maison de Claire et Bruno, each room includes a wardrobe. Rooms are fitted with a private bathroom. Guests at the accommodation can enjoy a continental breakfast. Saintes is 43 km from Maison de Claire et Bruno. Located a 5-minute drive from Jarnac, Hotel Restaurant Karina is set in a former distillery and offers an outdoor swimming pool, garden and terrace. Angouleme is 31 km away. All rooms feature a flat-screen TV with cable channels and a dressing room, while the suite also offers tea and coffee making facilities. The en suite bathroom includes a hairdryer and free toiletries. A continental or full English breakfast is available each morning at Hotel Restaurant Karina. Guests can also sample traditional French cuisine in the à la carte restaurant. Additional features include a bar, bicycle rental, free Wi-Fi access throughout and free public parking on site. Cognac and its famous distilleries are just a 20-minute drive away. Located in Neuvicq-le-Château, Maison charentaise renovée features accommodation with a terrace and free WiFi. The holiday home is in an area where guests can engage in activities such as hiking and tennis. The holiday home comes with 3 bedrooms, a flat-screen TV and a fully equipped kitchen that provides guests with an oven, a microwave, a washing machine and a toaster. The property also has 1 bathroom with a bath or shower. The holiday home offers a barbecue. Guests can also relax in the garden. Angoulême is 35 km from Maison charentaise renovée, while Cognac is 21 km away. The nearest airport is La Rochelle - Ile de Re Airport, 108 km from the accommodation. Guest accommodation Rouillac Preferred hotel ! Offering a heated outdoor swimming pool and a children’s playground, The Courtyard is located 4.5 km from Rouillac, in a 1.2 acres nature reserve. Free Wi-Fi is available in the cottages. Each cottage has a private garden with furnished terrace, sun loungers and barbecue facilities. They also come with a living room featuring a flat-screen TV and DVD/CD players, and a bathroom with a shower and towels. The kitchens at The Courtyard are fully equipped with a dishwasher, a washing machine, an oven and a refrigerator. The children's playground includes a basketball pitch, trampoline, swing ball and wooden climbing frame with slide and swings. An array of activities can be enjoyed on site or in the surroundings, including hiking and guests can request to hire some bikes. Pony riding can also be enjoyed just a 5-minute drive away. Cognac is a 30-minute drive from The Courtyard, Jarnac is a 15-minute drive away and Angouleme is 24 km away. There is free on-site parking. Logis de Guitres - Chambres d'Hotes offers B&B accommodation at the heart of the Cognac region. There is free Wi-Fi, and a garden with terrace at this 18th-century house. You can enjoy a countryside view from all the spacious suites, which feature a private bathroom with a shower. Located on the first floor, they also feature a desk. In the morning at Logis de Guitres - Chambres d'Hotes, a homemade continental breakfast is served in the dining room. Some restaurants can be found in Jarnac, 3.5 km away. An array of activities can be enjoyed on site or in the surroundings, including cycling, hiking and visiting the vineyards. Cognac is 18 km away and the property offers free parking. Holiday Home Neuvicq Le Chateau Rue Des Porches is situated in Neuvicq-le-Château. This holiday home also features a private pool and free WiFi. The 4-bedroom holiday home has a living room with TV, and a fully equipped kitchen with dishwasher. The holiday home offers an outdoor pool. Saintes is 50 km from Holiday Home Neuvicq Le Chateau Rue Des Porches, while Angoulême is 37 km from the property. The nearest airport is La Rochelle - Ile de Re Airport, 106 km from the accommodation. Set in an ancient house, La Fontenelle Chambres d'Hôtes is a guest house located 10 km from Cognac. There, guests will relax in the garden or on the terrace and enjoy the outdoor swimming pool. Free Wi-Fi is available throughout the property. La Fontenelle Chambres d'Hôtes features rooms with views of the garden or of the countryside. They all have a wardrobe, a seating area and a bathroom with a shower, a toilet and free toiletries. In the morning, a continental breakfast is served. Upon prior reservation, guests can share a meal of Sri Lankan or Charente cuisine at the owner’s table. Cognac vineyards can be visited in the surroundings, as well as the Gallo-Roman site of Saintes 40 km away. Cognac Train Station is a 10-minute drive from this property where free parking is possible. Located 14 km from Cognac and a 30-minute drive from Angoulême, Hôtel Ligaro is a boutique hotel set in an old Charentais house in Jarnac. The rooms offer a view of the garden or l'Eglise St Pierre, and all are air conditioned and offer free Wi-Fi. Rooms also have flat-screen TV, a minibar, an iPod/iPhone docking station and a safety deposit box. A continental breakfast is available every morning. Restaurant du Château, the hotel's gastronomic restaurant, is 300 metres away. Packed lunches and room service are available upon request. Free public parking is available in front of the property and parking with an extra cost is available 100 metres away. Cognac is 15 km from the property and the Cognac Golf Club is a 10-minute drive away. Surrounded by vineyards, Gîte L’En Haut des Vignes is a 3-bedroom cottage located in Mérignac. The cottage offers free Wi-Fi and guests have access to a shared swimming pool in the garden. Gîte L’En Haut des Vignes features exposed stone walls and a living room with a TV and a fireplace on the ground floor. Two bathrooms, a CD player and a washing machine are provided. The kitchen is fully equipped with a dishwasher, a coffee maker and a microwave and meals can be enjoyed in the dining area. Barbecue facilities are also available in the garden. Free private parking is possible on site and the centre of Angoulême is 19 km away. The property is 15 km from Jarnac and a 20-minute drive from Cognac Train Station. Located in Jarnac, 12 km from Cognac and 26 km from Angoulême, Gîtes Les Suites du Ligaro feature a sun terrace and views of the garden. Free WiFi is offered . The accommodations are all equipped with a flat-screen TV. Some units feature a dining area and terrace. All units include a kitchen equipped with a dishwasher and microwave. A toaster, a fridge and stovetop are also provided, as well as a kettle. There is a private bathroom with bathrobes and slippers in each unit. Bed linen and towels are featured. Every morning, breakfast is available at the hotel or can be delivered to your accommodation. A baker can be found nearby. A restaurant is open for meals or catering service. Free public parking is available near the property. Saintes is 36 km from Gîtes Les Suites du Ligaro, while Jonzac is 33 km away. Located a 5-minute drive from the centre of Jarnac, Chambres d'hôtes Gondeville offers a garden with a furnished terrace. Free WiFi access is available in this B&B. Chambres d'hôtes Gondeville has rooms with a seating area. The private bathroom comes with a shower and a hairdryer on request. Breakfast is served daily and restaurants can be found within a 5-minute drive. Other facilities offered at the property include a shared lounge exclusively for guests. Guests can explore Cognac vineyards and enjoy tasting in the surroundings as well as enjoy hiking and bicycling. Cognac Train Station is a 15-minute drive from the property. Offering access to a shared outdoor pool and views of the pool, Gondeville Gîtes is set in Gondeville in the Poitou-Charentes Region, 38 km from Saintes. Angoulême is 25 km away. The accommodation features a seating area with a satellite TV, Blu-ray player, and DVD player. Some units include a dining area and/or patio. There is also a kitchenette, fitted with an oven, microwave and toaster. A fridge and stovetop are also provided, as well as a kettle. There is a private bathroom with a bath or shower in each unit. Bed linen and towels are provided. Gondeville Gîtes also includes a barbecue. Cognac is 13 km from Gondeville Gîtes. Free onsite parking is provided. Located in Triac-Lautrait, between Bassac and St Meme Les Carrieres, 40 km from Saintes, The Riverside Retreat features a barbecue and views of the river. Free WiFi is featured and free private parking is available on site. The room is fitted with a private bathroom with a shower and toilet. Extras include free toiletries and a hairdryer. There is a shared lounge and library. A coffee machine and tea making facilities are at guests' disposal. You can engage in various activities, such as fishing and canoeing. Bassac and Saint-Même-les-Carrières are a few minutes' drive away. Angoulême is 22 km from The Riverside Retreat, while Cognac is 16 km from the property. Located in Siecq, le Tresor Cache de Siecq provides accommodation with free WiFi, seating area and flat-screen TV. There is a private bathroom with shower and free toiletries in each unit, along with a hair dryer. A continental breakfast is served every morning at the property. The bed and breakfast offers a barbecue. Guests can go cycling or relax in the garden. Saintes is 47 km from le Tresor Cache de Siecq, while Angoulême is 38 km from the property. La Rochelle - Ile de Re Airport is 103 km away. Offering a spa and wellness centre and free bikes, B&B L'escapade is located in Sainte-Sévère. Free WiFi access is available in the public areas. The bedrooms have an electric kettle, a private bathroom with a hairdryer, and garden views. Extras include a desk and a fan. Other facilities offered at the property include a shared lounge. An array of activities can be enjoyed on site or in the surroundings, including golfing, cycling and horse riding. The property offers free parking and La Rochelle - Ile de Re Airport is 86 km away. Situated in the heart of Charente region, L’Essille is located just 13 km from Cognac and and its airport. The property features a spa complete with a massage table and a hot tub. There is also a garden with a terrace and a tennis court. Air-conditioned guest rooms are individually decorated and are equipped with a television and telephone. All rooms have a private bathroom. Free Wi-Fi internet access is available throughout the hotel. Rooms also offer views of the surrounding area. The Essille Hotel restaurant offers traditional meals and well-selected wines. A buffet breakfast is served every morning. Packed lunches are also available. With free private parking on site, hotel L’Essille is a 15-minute drive from François I Park and a 20-minute drive from Angoulême. Bicycle rental is also available on site. Featuring river views, Le Moulin de Bassac in Bassac provides accommodation and free bikes. Free WiFi is provided. There is a seating and a dining area in all units. A continental breakfast is served daily at the property. The bed and breakfast offers a barbecue. Guests can also relax in the garden. Saintes is 48 km from Le Moulin de Bassac, while Angoulême is 25 km from the property. Holiday home 1 Route de Liners is set in Julienne and offers barbecue facilities. This property offers access to free WiFi. The holiday home is fitted with 4 bedrooms, a TV and a fully equipped kitchen that provides guests with a dishwasher, an oven, a washing machine and a microwave. Saintes is 39 km from the holiday home, while Angoulême is 37 km away. Near the Charente River, La Closerie is surrounded by vineyards and features a manicured garden, outdoor swimming pool, BBQ facilities and Wi-Fi is free of charge in the entire property. The rooms at La Closerie have a seating area and a desk. Individual heating and a private bathroom are also provided. The fully equipped kitchen is at guests’ disposal and includes a stove, oven, refrigerator, microwave, kitchenware, electric kettle , toaster and coffee machine. A TV is available for guests to use in the public area. Free private parking is provided on site making the B&B an ideal base from which to explore the Poitou-Charentes region by car. The hotel offers easy access to Cognac city. Offering free WiFi and river views, Vieux veillard is an accommodation located in Bourg-Charente. Guests staying at this holiday home have access to a fully equipped kitchen. Comprising of 3 bedrooms and 1 bathroom, this holiday home has a TV. Saintes is 39 km from the holiday home. Situated in Bourg-Charente, Petit Moulin De Veillard provides accommodation with free WiFi and a garden with a barbecue and river views. The units come with parquet floors and feature a fully equipped kitchen with a dishwasher, a dining area, a flat-screen TV, and a private bathroom with shower and free toiletries. An oven, a microwave and toaster are also available, as well as a coffee machine and a kettle. A bicycle rental service is available at the apartment. Saintes is 39 km from Petit Moulin De Veillard, while Angoulême is 34 km from the property. Offering free WiFi and river views, La Maison du Bonheur is an accommodation set in Bourg-Charente. Guests staying at this holiday home have access to a fully equipped kitchen. The holiday home comes with a satellite flat-screen TV and a living room. Saintes is 38 km from the holiday home, while Angoulême is 36 km away. Holiday home Saint Medard de Rouill 47 is located in Marcillac-Lanville. The accommodation features free WiFi. The holiday home is fitted with a TV. Angoulême is 36 km from the holiday home. Poitiers-Biard Airport is 100 km away. Set in Auge-Saint-Médard, this self-catering accommodation features a seasonal outdoor pool. Guests can benefit from a terrace and a barbecue. Free WiFi is offered and free private parking is available on site. The kitchen features a dishwasher, an oven and a microwave, as well as a coffee machine. A flat-screen TV is featured. There is a private bathroom with a shower. Saintes is 44 km from Olive & thyme, while Angoulême is 31 km from the property. Poitiers Airport is 86 km away. Offering a seasonal heated outdoor pool and barbecue, La Maison des Grands Bambous is situated in Louzignac, 32 km from Saintes. Free WiFi is provided throughout the property and free private parking is available on site. La Maison des Grands Bambous offers accommodation in guest rooms or cottages. Rooms have either a private or shared bathroom, with free toiletries and a hairdryer. The cottages feature a fully equipped kitchen, dining area and living room. Evening meals can be served at an extra cost, upon prior request. Free use of bicycles is available at this bed and breakfast and the area is popular for cycling. Angoulême is 37 km from La Maison des Grands Bambous, while Cognac is 17 km away. The nearest airport is La Rochelle - Ile de Re Airport, 83 km from La Maison des Grands Bambous. Bed and Breakfast Genac Preferred hotel ! La Grange aux Dames in Genac features water sports facilities and a seasonal outdoor swimming pool. Boasting a shared lounge, this property also provides guests with a terrace. Both free WiFi and private parking are available at the bed and breakfast. Guest rooms at La Grange aux Dames are equipped with a seating area. Rooms include a private bathroom with a shower, while certain rooms are equipped with pool views. All units include a wardrobe. Guests at the accommodation will be able to enjoy activities in and around Genac, like cycling, fishing and hiking. Angoulême is 20 km from La Grange aux Dames. Limoges International Airport is 90 km away. Offering a tennis court, la Belle Charentaise offers accommodation in Mainxe. Free WiFi is offered. All units comprise a seating area, and a fully equipped kitchen with various cooking facilities, including a dishwasher, an oven and a microwave. A toaster and fridge are also featured, as well as a coffee machine and a kettle. The farm stay offers a continental or buffet breakfast. Guests can dine in the on-site restaurant, which serves a variety of French dishes. La Belle Charentaise offers a barbecue. Guests at this property can enjoy fishing and hiking nearby, or make the most of the garden. Saintes is 45 km from the accommodation, while Angoulême is 32 km away. Guest accommodation Haimps Preferred hotel ! La Bonne Année offers 2 holiday accommodations with a garden, located in Charente-Maritime. It provides free private parking. Free WiFi is offered. The kitchens have an oven and a microwave, as well as a coffee machine and a kettle. A flat-screen TV is available. There is a private bathroom with a bath or shower. Saintes is 31 km from La Bonne Année, while Angoulême is 38 km away. The nearest airport is La Rochelle - Ile de Re Airport, 100 km from La Bonne Année. Bordeaux Airport is 150 km away. Offering a garden, Gites de Cognac offers accommodation in Bréville. Saintes is 26 km away. Free private parking is available on site. Featuring a terrace, all units include a dining area and a seating area with a flat-screen TV. There is also a kitchen, fitted with a dishwasher and oven. A microwave and toaster are also provided, as well as a coffee machine. There is a private bathroom with a hairdryer in each unit. The holiday home features free WiFi throughout the property. Gites de Cognac also includes a seasonal outdoor pool. You can play table tennis at the property, and free use of bicycles is available. Angoulême is 39 km from Gites de Cognac, while Cognac is 11 km from the property. The nearest airport is La Rochelle - Ile de Re Airport, 82 km from Gites de Cognac. Offering an outdoor pool and hot tub, Poppy's Paradise is set in Bréville, 26 km from Saintes. Guests can enjoy the on-site bar. Free WiFi is available and free private parking is available on site. All rooms are fitted with a flat-screen TV with satellite channels. Certain rooms have a seating area to relax in after a busy day. Every room is fitted with a private bathroom fitted with a shower. For your comfort, you will find free toiletries and a hairdryer. There is a shared lounge at the property. Evening meals are available upon prior request. Free use of bicycles is available at this bed and breakfast and the area is popular for golfing. Angoulême is 39 km from Poppy's Paradise, while Cognac is 11 km away. The nearest airport is La Rochelle - Ile de Re Airport, 81 km from Poppy's Paradise. Poppy's Retreat is set in Bréville and offers free bikes and a seasonal outdoor swimming pool. Featuring garden views, this holiday home also includes free WiFi in public areas. With direct access to a terrace, this holiday home comes with 2 separate bedrooms. There is a seating area, a dining area and a kitchen equipped with an oven. Guests at the holiday home can enjoy a continental breakfast. Saintes is 27 km from Poppy's Retreat, while Angoulême is 39 km away. La Rochelle - Ile de Re Airport is 81 km from the property. Guest accommodation Cherves-de-Cognac Preferred hotel ! Located in Cherves-de-Cognac, Château de Champblanc features accommodation with access to a garden. Free WiFi is provided. A patio with garden views is offered in each unit. A continental breakfast is available every morning at the homestay. Château de Champblanc offers a terrace. A bicycle rental service is available at the accommodation. Saintes is 30 km from Château de Champblanc, while Angoulême is 44 km from the property. La Rochelle - Ile de Re Airport is 112 km away. Offering a restaurant and free bikes, Keyoha Chambres & Tables d'Hôtes is located in Jarnac. Each room here will provide you with a terrace. Private bathroom also comes with free toiletries. You can enjoy garden view from the room. Extras include bed linen. At Keyoha Chambres & Tables d'Hôtes, you will find a garden and a terrace. Other facilities offered at the property include meeting facilities. An array of activities can be enjoyed on site or in the surroundings, including hiking. The property offers free parking. Le Petit Chêne Vert is a detached holiday home with a terrace, situated in Beauvais-sur-Matha. The property boasts views of the garden and is 38 km from Saintes. There is a seating area, a dining area and a kitchen complete with an oven and a microwave. A flat-screen TV and DVD player are featured. Other facilities at Le Petit Chêne Vert include a barbecue. Angoulême is 37 km from Le Petit Chêne Vert, while Cognac is 23 km away. The nearest airport is La Rochelle - Ile de Re Airport, 84 km from the property. Offering a barbecue and views of the garden, L'ESCALE is set in Beauvais-sur-Matha in the Poitou-Charentes Region, 38 km from Saintes. Every room comes with a flat-screen TV. You will find a coffee machine in the room. Extras include free toiletries and a hairdryer. Angoulême is 37 km from L'ESCALE, while Cognac is 24 km away. La Rochelle - Ile de Re Airport is 84 km from the property. Hotel Châteaubernard Preferred hotel ! The Château de L'Yeuse is located 2.5 km from Cognac, near the banks of the River Charente. It offers classic accommodation and a sauna, spa, Turkish bath and outdoor swimming pool. Breakfast includes homemade and organic produce. All guest rooms offer views of the countryside and have satellite TV and Wi-Fi access. The hotel has a large terrace with panoramic views of the Charente countryside, where guests can eat and relax with a drink from the bar. The Yeuse’s restaurant serves gourmet cuisine and offers a variety of wines, served in one of the Château’s large dining rooms or on the terrace. The hotel’s spa has a hot tub, sauna and offers massage therapy. Guests of the Yeuse can enjoy hiking and cycling nearby and travel the 7 km to Cognac Golf Club. Featuring a heated outdoor pool and terrace, Boutique retreat France is a villa, set near Saint-Saturnin. Guests can enjoy the gardens, patio and barbecue area. Free private parking is available on site. The kitchen is equipped with a dishwasher. Towels and bed linen are provided at Boutique retreat France. The villa features free WiFi throughout the property. Angoulême is 11 km from Boutique retreat France, while Cognac is 27 km from the property. Guests can enjoy various activities in the surroundings, including horse riding, fishing and cycling, as well as kayaking. Ideally situated in a 1-hectare park, Domaine de l’Echassier is 30-minutes from Saintes. The hotel features an outdoor swimming pool, a terrace and a bar. The rooms and apartments with park views offer a flat-screen TV with satellite channels and a minibar. Each has an en suite bathroom with a hairdryer. On weekdays, the gastronomic restaurant serves inventive cuisine on reservation only, and offers a range of Cognac, sourced from the local area. Guests can enjoy the buffet breakfast from the comfort of their own room or on the terrace overlooking the garden. Cognac city centre is a 10-minute drive away and Aéroport Cognac-Châteaubernard can be found in 7 km. The hotel offers free private parking and Wi-Fi is available throughout the hotel. 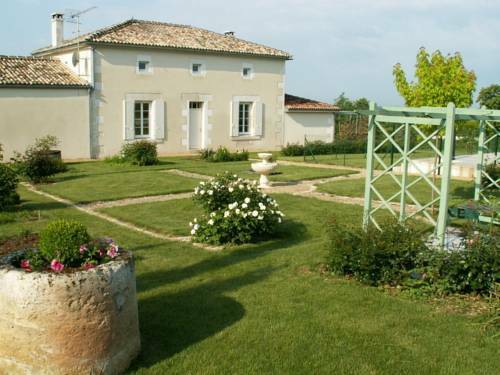 La Ferme Fortin is situated in Gensac-la-Pallue and offers free bikes and a tennis court. The accommodation features free WiFi. This holiday home comes with a fully equipped kitchen, a dining area and a flat-screen TV. The holiday home also offers 2 bathrooms with a shower. The holiday home offers a terrace. If you would like to discover the area, fishing, canoeing and hiking are possible in the surroundings. Saintes is 37 km from La Ferme Fortin. Ibis Styles Cognac is located in Cognac, a 5-minute drive from the city centre, the Cognac distilleries and the banks of the Charente River. It offers an outdoor pool and free WiFi access. The guest rooms at the Ibis Styles Cognac hotel are soundproofed and air-conditioned. Each has a private bathroom with a shower and toilet. Guests can enjoy a drink in the hotel bar or relax on the outdoor terrace. The Ibis Styles Cognac hotel’s staff are available to assist you 24 hours a day. Bordeaux and La Rochelle are a 90-minute drive from the Ibis Styles Cognac and free private parking is provided. Guest accommodation Mons Preferred hotel ! Set in Mons, La Grue Gites features accommodation with free WiFi, seating area and a kitchen. Each unit comes with a dishwasher, oven, a coffee machine, as well as a microwave and kettle. There is a fully equipped private bathroom with shower and a hair dryer. The holiday home offers an outdoor pool. A bicycle rental service is available at La Grue Gites. Angoulême is 35 km from the accommodation, while Cognac is 40 km from the property. The nearest airport is Poitiers-Biard Airport, 95 km from the property. Offering free WiFi and garden views, La Croix is an accommodation located in Marsac. Guests staying at this bed and breakfast have access to a fully equipped kitchenette. The bed and breakfast is fitted with a TV. A continental breakfast is available every morning at the bed and breakfast. La Croix offers a seasonal outdoor pool. A terrace can be found at the property, along with a shared lounge. Angoulême is 16 km from the accommodation, while Cognac is 44 km away. The nearest airport is Limoges International Airport, 108 km from the property. Bed and Breakfast Marsac Preferred hotel ! Set in Marsac, Domaine De Chantemerle B'nB features accommodation with free WiFi. A patio with garden views is offered in all units. The bed and breakfast offers a continental or buffet breakfast. Domaine De Chantemerle B'nB offers a barbecue. There is a garden at this property and guests can go cycling nearby. Angoulême is 13 km from the accommodation. The nearest airport is Limoges International Airport, 105 km from Domaine De Chantemerle B'nB. Situated in Champmillon, Four-Bedroom Holiday Home in Champmillon offers accommodation with a private pool. Guests can go for a swim in outdoor pool and enjoy the free WiFi. The holiday home includes a kitchen with a dishwasher and a microwave, as well as a coffee machine. Angoulême is 18 km from the holiday home, while Cognac is 33 km from the property. Situated in Haimps, Maison De Cognac features accommodation with a private pool and garden views. The property was built in 19th century and features accommodation with a patio. This 3-bedroom holiday home includes 2 bathrooms fitted with a bath. There is a dining area and a kitchen complete with a dishwasher, an oven and a microwave. Guests can also relax in the garden. Saintes is 32 km from the holiday home, while Angoulême is 40 km from the property. The nearest airport is La Rochelle - Ile de Re Airport, 80 km from the property. Le Passiflore is located 1.5 km from the centre of Cognac. It offers air-conditioned rooms, a restaurant and free private parking. Free Wi-Fi is available throughout the hotel. Rooms at Le Passiflore are equipped with satellite TV, a telephone and private bathroom with shower or bath. Le Passiflore’s restaurant serves traditional French and regional cuisine for dinner. Activities near Passiflore include wine and cognac tasting and outdoor activities. The hotel is on the road to Angoulême. Offering a barbecue and sun terrace, as well as an indoor pool, Jardins en Ville is set in Cognac in the Poitou-Charentes Region, 25 km from Saintes. Free private parking is available on site. All rooms include a private bathroom. Extras include bath robes, slippers and free toiletries. Jardins en Ville features free WiFi . The bed and breakfast also offers free use of bicycles. Angoulême is 37 km from Jardins en Ville, while Jonzac is 29 km from the property. The nearest airport is La Rochelle - Ile de Re Airport, 86 km from Jardins en Ville. Below here is the hotels map of Plaizac. Names and details of Plaizac hotels can be shown on the map clicking on the prices icons.